Providing you the best range of cryogenic tanks, cryogenic tanks for storage of liquefied gases, vacuum insulated storage tank, repair of pressure vessel and heat exchanger, insulated tank and asme u stamp coded cryogenic vessel with effective & timely delivery. We design and manufacture Cryogenic Tanks for Liquefied Gases complete with running gear for Liquid Oxygen, Nitrogen, Argon and LNG in capacities up to 24000 liters. The tanks are designed to store the liquefied gases at (-) 196 Deg C and provided with necessary safety fittings. 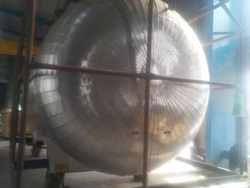 The tanks are double walled with inner stainless steel and outer carbon steel. Annular space is filled with perlite or super insulation. Finally, a high degree of vacuum is created in the annular space. We design and manufacture storage tanks complete with running gear for Liquid Oxygen , Nitrogen, Argon and LNG in capacities up to 24000 litres. The tanks are designed to store the liquified gases at (-) 196 Deg C and provided with necessary safety fittings.The tanks are double walled with inner stainless steel and outer carbon steel. Annular space is filled with perlite or super insulation. Finally a high degree of vacuum is created in the annular space. 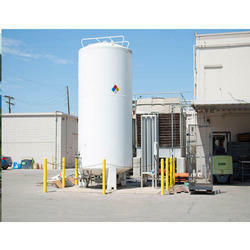 We are a leading firm engaged in the design, manufacture, & supply of Vacuum Insulated Cryogenic Transportation Tank. We are committed to bringing quality in the offered products. For the same, we fabricated these products with superior-grade raw material implementing advanced manufacturing technologies. 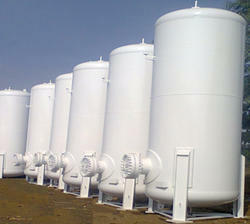 Offered tanks are used for transportation of liquid gases and thus, are very coveted in different industries. Our factory has been approved by The Chief Controller of Explosives, Petroleum and Explosives Safety Organization, Nagpur (India) for the manufacture of unfired pressure vessels under the SMPV (U) Rules, 1981 vide letter no. PV(M)858 dated 14.08.2013. We are one of the leading service providers of Repair Of Pressure Vessel and Heat Exchanger. We have our own National Board Authorised R Stamp Workshop For Repair Of Pressure Vessel and Heat Exchanger. 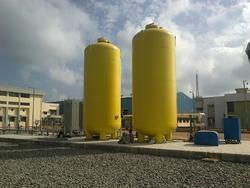 We have over 30 years of rich experience in the design and manufacture of liquid carbon dioxide storage tanks. Besides design and manufacture, we have the additional experience of operating carbon dioxide storage tanks and this gives us the leading edge with technical expertise along with practical experience of using the equipment. Our intricate design is the outcome of our experience in operation of these tanks. We are one of the leading manufacturer of different capacity of Cryogenic Tanks , Cryogenic Vessels under ASME U Stamp Coded.